According to the standard classifications of African languages, the Baoulé language is a Kwa language and belongs to the Niger-Congo family which covers the territory from the western tip of Africa in Senegal to the southern tip of South Africa. Variation in the use of tones in Baoulé is a major component of dialectal variation. The Baoulé are the most populous group of the West African Côte d’Ivoire. Like the overwhelming majority of cultures around the world, they use oral transmission to pass their cultural traditions from person to person, and from generation to generation. The art of speaking well is highly prized, and those who have this gift are respected in the society. The present study first presents an introduction into geography, language and culture of the region and discusses the oral tradition in its context. 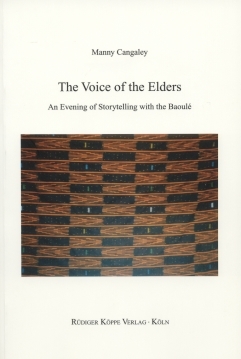 Subjects and structures of the Baoulé stories vary, whereas songs play the same important role in oral literature like fables, fairy tales, ghost stories and myths do. The collection of 15 original stories are put opposite to their English translations. It was taken much care to represent them in a lively and literary appealing way so that it would not only be of any interest for the philologically oriented readership. Furthermore, this documentation offers rich material for further research in oral literature and comparative linguistics.